Today, every company is aware of the need to keep track of its valuable assets and equipment. Whether fixed or moveable each company asset can be easily located if marked with an asset label. In addition you can not only track the items location, but also check which particular asset is used by which person. Additionally, asset labels also protect your expensive assets by dettering theft. 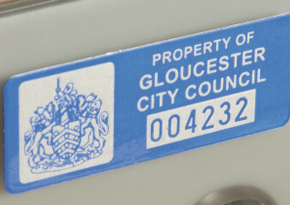 Metallised Polyester Asset Labels are particlarly useful being both highly versitile and hard wearing. By including a barcode on the polyester asset label you can easily keep your inventory up-to-date. If you need to send your assets out of your company premises for repair or other purpose, the asset labels will differentiate your items from other similar assets. You can also include your company logo, which not only give a stronger visual identification, but also can put your company brand in front of others. Thus you can use these polyester labels to advertise your products as well. Metalised polyester asset labels have a high temperature resistance, up to 150ºC short term, and down to - 40ºC as such these asset labels are one of the most universal asset labelling solution. Polyester asset labels are also suitable for extreme harsh environments and industrial applications. Dantech, as a market leader in asset marking for industrial and harsh environments, can provide expert help and advice call us on 01354 688 488 or complete our contact form.